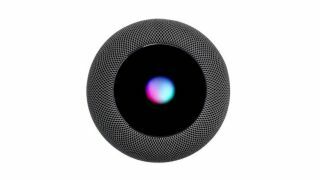 New HomePod may include Face ID, screen and gesture controls | What Hi-Fi? We're big fans of the Apple HomePod, even if it seems we might be in a relative minority. Despite great sound and some clever integration with your iPhone and Apple Music, it's widely rumoured that the HomePod hasn't been as big a seller as Apple hoped. So, perhaps it's time for a HomePod 2 with some headline-grabbing features? One patent Apple has filed in recent days points to a next-generation HomePod that features Face ID, 3D gesture controls and much more besides. The patent, picked-up by MacRumors, suggests a new HomePod could identify users with "facial recognition", no doubt Apple's own Face ID. The use cases for this... we're not so sure about, but it would add an extra layer of personal security to your HomePod, which could bring it with some previously untapped functionality. More easy to imagine is the addition of gesture controls, which is also mentioned in the patent. The listing mentions a voice-controlled speaker with sensors and cameras to support "hand gestures and other three-dimensional gesture input". Sonos speakers already feature swipe and touch sensitive controls, though this requires you to touch the device, while classic B&O hi-fi products did famously respond to hand movements. The patent also mentions voice and gesture control of a "visual output device", touch sensitive displays capable of displaying 'now playing' information and app notifications, LED lights, the ability to communicate with other smart devices in your home... and plenty more besides.